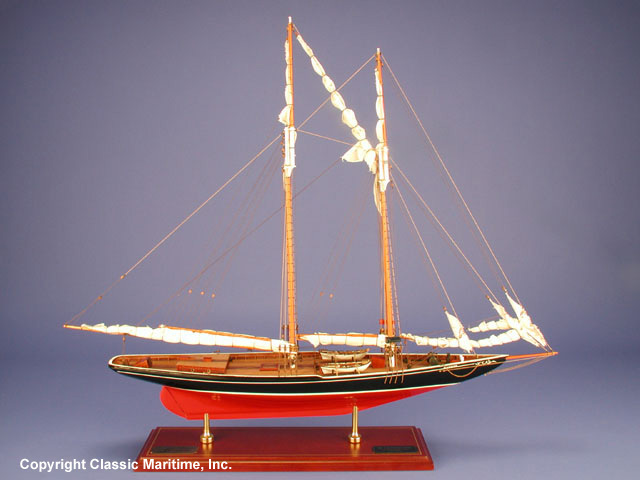 The Bluenose, which was constructed in Nova Scotia, was both a fishing schooner and a racer. She raced for the International Trophy, put up by the Halifax Herald as a rival to the America’s Cup. She was built specifically for the competition and won it easily at her first attempt in 1921, again in 1922, in 1930, and in 1937, its final year. The Bluenose was sold to the West Indies Trading Company in 1942 and was wrecked off Haiti in 1946. In 1963, the government of Nova Scotia commissioned the two-masted gaff topsail schooner Bluenose II, an exact replica of the original ship. Dimensions (L x W x H): 28.0" x 5.0" x 24.0"